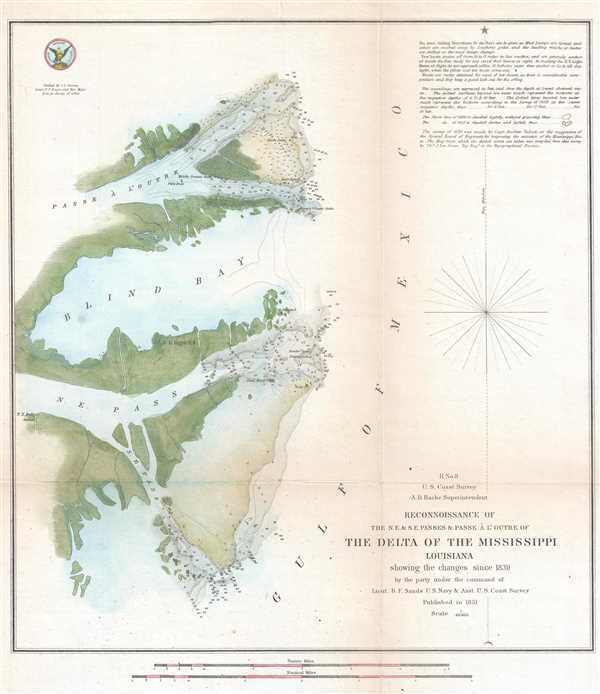 Nautical chart of the Mississippi River Delta. H No. 8 Reconnoissance of the N.E. and S.E. Passes and Passe A l'Outre of The Delta of the Mississippi Louisiana. An attractive hand colored 1851 U.S. Coast Survey nautical chart or map of the Mississippi Delta. The map depicts the Louisiana coast from Passe À L'Outre to the Southeast Pass. Numerous depth soundings are included and the locations of lighthouses, shoals, Drift Trees, and Stakes are illustrated. Due to the quick and dramatic changes in the Delta area caused by sudden storms and hurricanes, charting the Mississippi Delta was one of the U.S. Coast Survey's most daunting tasks. Notes on tides, sailing instructions, and commentary on the chart are situated in the upper right corner. This chart was compiled under the direction of A. D. Bache, Superintendent of the Survey of the Coast of the United States and one of the most influential American cartographers of the 19th century. It was published in the 1851 edition of the Report of the Superintendent of the United States Coast Survey. Very good. Backed on archival tissue for stability. Minor wear and toning along original fold lines. Blank on verso.